"As Teddy Roosevelt said, 'Talk softly and carry a big stick.' You'll hear very little out of Gene Anderson." The famous "Enough Said" Gateway poster available in 2004-2005 featuring Gene Anderson's boots hanging from a corner ring post. Bob Caudle: Gene Anderson, the quiet one of the pair of Gene and Ole Anderson. David, a lot of the wrestlers are talking about it, and a lot of the fans, and even though Gene Anderson is quiet when it comes to talking, I’m not so sure he’s not the more deadly of the two Andersons. David Crockett: He is deadly. He lets all his actions speak for himself in that ring. 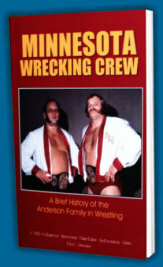 People occasionally comment on the fact that Gene Anderson rarely spoke during interviews conducted with the Minnesota Wrecking Crew. The very fact that Gene Anderson didn’t talk during interviews made him more of a threatening character to me when I was first watching wrestling in the mid-1970s. He just stood there beside his brother Ole, with that menacing twitch and that icy stare. (3) and that famous hammerlock slam, the "Anderson slam", on an opponent's arm. Bob Caudle and David Crockett talked on and on about that hammerlock slam on television, really putting it over. No other team did any move quite like that slam at that time. “Pick one part of the body, and stay on it”, Bob and David would say. It was so simple back then, and it just worked. And then there was the famous “Supreme Sacrifice” match the Anderson Brothers had with Wahoo McDaniel and Paul Jones. This was the match that got me hooked on wrestling at 13 years of age. 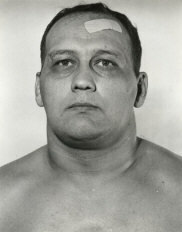 Near defeat, a desperate Ole Anderson threw Wahoo McDaniel into Gene Anderson who was waiting in his corner, their heads violently colliding, knocking both men out. Ole covered an unconscious Wahoo for the pinfall. Gene lay motionless on the floor outside the ring. The Andersons had regained their championship, and a brother had sacrificed a brother to get it done. I guess that was supposed to make the Andersons seem more like the bad guys, but to my twisted way of looking at it, they were more like heroes. I was shocked at first that Ole would sacrifice his own brother to win the titles. But when they showed the tape again, it seemed almost inspired that Gene had gone along with this, leaning over the ropes at ringside, head extended, as if asking for the shot. I remember my friends and I having this long discussion about which brother actually made the bigger sacrifice? Was it Ole giving up his own brother? Or Gene sacrificing himself? Either way, as kids we were blown away that they would do such a thing to get those world tag team championship belts back. We loved Wahoo and Paul, but we were impressed that the Andersons wanted it that much more. This seemed real to us. The following week when the Andersons came out on TV with the belts they had regained in that match, Gene, as usual, never said a word. He just stood with Ole, both of them holding their belts. There was no angle to tease a break up of the team like what would be required today. The sacrifice had united them as never before. No one had a chance of getting those belts from the Andersons now. Gene Anderson had sacrificed himself so that he and his brother could get their belts back. Without saying a single word, that was one powerful statement. Gene Anderson always said more by saying less.